Kohli smashed his 23rd Test century on Monday. The world is at a loss of adjectives to describe Indian batting legend Virat Kohli now. 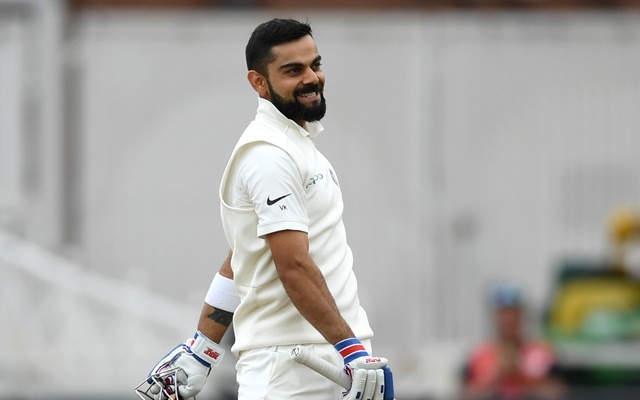 The Indian captain hit his second hundred of the ongoing Test series in England on Day 3 of the third Test at Trent Bridge to take his team to a commanding position. His 103 off 197 balls was also his 23rd in the format and he is now joint fourth with Virender Sehwag in the list of highest century-makers for India in the whites. Kohli was showered with praise not just by fans and Indian former cricketers but also by former English captains as well. After Michael Vaughan asserted that his the best player in the world, another former Three Lions captain Nasser Hussain called him as the greatest player on the planet. “Kohli might not feel he had a point to prove in England after his 2014 tour but world cricket was waiting to see if he could get runs here to cement himself as a great and be up there with Sachin Tendulkar and Sunil Gavaskar for India,” Hussain wrote in his column for Sky Sports. “I believe he is the greatest player on the planet right now. I like the balance he has between intensity and having a relaxed nature – he will talk to the umpires, talk to Anderson, Stokes and Jos Buttler but the moment he is on strike, boy, does he switch on,” he further wrote. Kohli was under pressure ahead of the Test series owing to his massive failure in 2014 in which he scored a paltry 134 runs in 10 innings. But the Indian skipper came back strongly and has scored 440 runs in six innings already. He is only the second Indian captain after Mohammad Azharuddin (426) to achieve this feat against England in a three-Test series in 1990. He also surpassed former captain Sourav Ganguly (1,693 runs) as India’s highest scorer as captain in Tests overseas. Kohli also has 58 international hundreds now, 42 less than topper Sachin Tendulkar.